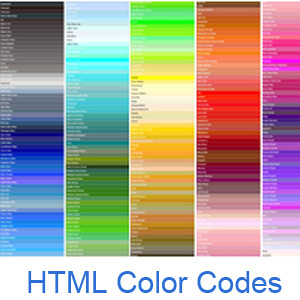 HTML color codes are hexadecimal triplets representing the colors red, green, and blue (#RRGGBB). For example, in the color red, the color code is #FF0000, which is '255' red, '0' green, and '0' blue. These color codes can be used to change the color of the background, text, and tables on a web page. Changing font color on a web page using CSS and FONT tags. All questions relating to CSS and HTML colors. Below are some of the common color names and codes. With these colors, you can also use the color name. For example, in HTML tags and CSS that use color codes, you could use "red" instead of "#FF0000". Tip: Use our HTML color picker if you need to choose from an almost infinite variety of colors. All color-related questions and answers.